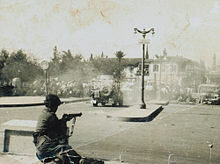 The Cyprus Emergency was a period of violent unrest in British Cyprus between 1955 and 1959. It was characterised by a confrontation between the British and the ethnic Greek National Organisation of Cypriot Fighters (EOKA) which sought the end of colonial rule and the unification of Cyprus and Greece (enosis). This was also opposed by Turkish Cypriots who formed the Turkish Resistance Organisation (TMT). The period of conflict ended in 1959 with the signature of the London-Zürich Agreements which established Cyprus as an independent state, but separate from Greece. In 1954 Britain announced its intention to transfer its Suez military headquarters (the office of the Commander-in-Chief, Middle East) to Cyprus. The insurgency began on 1 April 1955. After a series of follow up incidents, the Governor General Sir John Harding declared a state of emergency on 26 November of that year. In January 2019 the British government agreed to pay £1 million to 33 Cypriots who were tortured by British forces during the uprising. They including a woman, aged 16 at the time, who said she was detained and repeatedly raped by soldiers, and a man who lost a kidney as a result of his interrogation. The payout followed the declassification of government documents in 2012, although Foreign Office minister Alan Duncan stated that "the settlement does not constitute any admission of liability" but that "the government has settled the case in order to draw a line under this litigation and to avoid the further escalation of costs". ^ CYPRUS 1954-1959 SGM Herbert A. Friedman (R) and Brigadier General Ioannis Paschalidis "The TMT, though smaller and less well organized, followed EOKA tactics..."
^ Richard J. Aldrich, Ming-Yeh Rawnsley, The Clandestine Cold War in Asia, 1945–65: Western Intelligence, Propaganda and Special Operations, Routledge, 2013, 106. ^ "State Of Emergency Declared In Cyprus". The Central Queensland Herald (Rockhampton, Qld. : 1930–1956). Rockhampton, Qld. : National Library of Australia. 1 December 1955. p. 13. Retrieved 17 November 2013. ^ "UK government pays damages to 33 Cypriot pensioners". BBC News. 23 January 2019. Holland, Robert (1998). Britain and the Revolt in Cyprus, 1954–1959. Oxford: Clarendon Press. ISBN 9780198205388.